This skin is very special to me as I felt in love with it from the first scratch. It has been both challenge and nightmare. When skinning in general I used to go the way that for example toolbar background was of darker shade than windows background. This time I have proceeded vice-versa and when watching backwards I seem like I lost a half of my head. 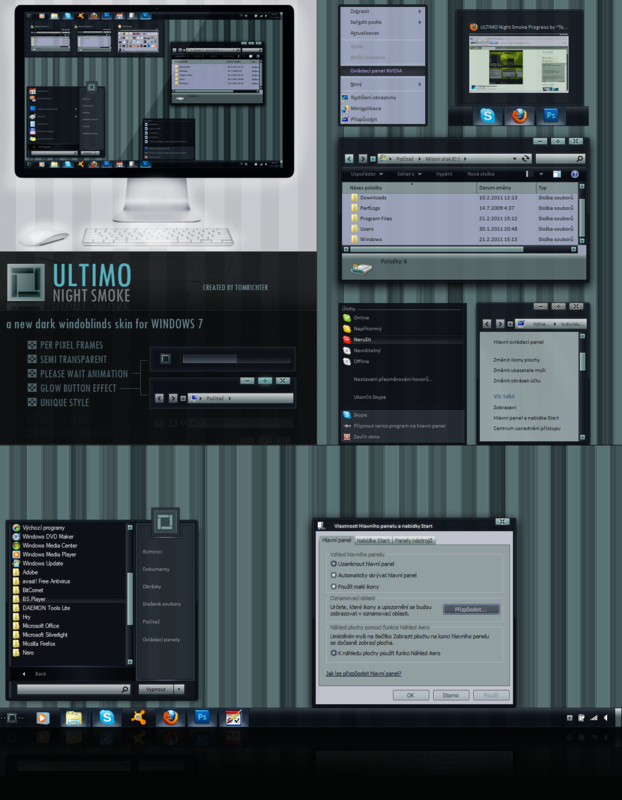 ULTIMO Night Smoke is a dark theme and I am sincerely hoping that not as those \"its-all-so-black-that-you-cant-see-anything-at-all "\ themes. I have paid a lot of attention to keep a certain harmony about the colour scale. A wallpaper being used as the backround is made by myself and I will put it for an immediate download in here. It is just 1280x800 res.made \"sorry I keep on fighting against the time so being glad this skin plus wall could have been finished at all"\. However Darren aka ShippD has been working on a special wallpaper for this skin. I am not sure if he is just in the middle of doing or not so far or more far, but once he is done, I will update the preview and add a link to it. Myself being curious what is that he is about to come up with. So thanks Darren, my man, for helping to complete the skin by some genious wallpaper. Then my thanks go to Karren McInnis for testing it. I am hoping that now it works even better. As for the right click as I said a sec ago on the email, I rectified it and now it should be working fine. Enjoy it, I would be glad if you can spend some hours with that and not just passing over. This is just perfect Tom - I really feel like I should be paying for these themes sometimes. Your talent is remarkable. Excellent skinning, Tom! Thank you!!! I am sorry this is WINDOWS 7 only. Why I did not mention that..
Lovely Blind Tom, it's a shame the vista logoff shutdown buttons don't work I am sorry this is WINDOWS 7 only. Why I did not mention that..
No worries trying to mod it at the moment. Terrific blind Tom. Picked this up at DeviantARt and I am using it now. Bravo my friend on a job well done. Dark skins = cool skins! Thanks for sharing. I love this blind and I have some of your other works in my collection. I think this is one of the best blinds you have ever done and I think it is great. The only problem it has on my computer is where the little picture is on the Start Menu is. I have Windows 7. I have that problem on some other blinds from some other people too. Is there any way that can be fixed in maybe a future update? It colors very well and there is no sacrifice there. It looks great whatever the color. Can the wallpaper be put on Wincustomize? I saw it on DeviantArt. I no longer download ANYTHING from there as I always get some kind of virus or trojan horse if I download anything from there. I love stripes and I think that is a great wallpaper for the blind. You have done a great job with this windowblind. Thank you very much for making it Tom. I give it five meows for you. You deserve it. Really impressive work Tom, super job! Thanks, Tom. Very nice, indeed. Dark but clear and sharp in use, great job!